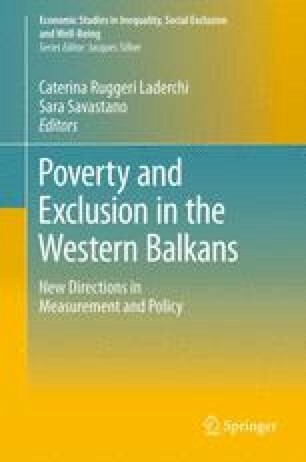 As countries in the Western Balkans proceed on the path to accession to the European Union, they need to strengthen their statistical tools for measuring poverty and social inclusion and achieve compliance with the statistical chapter of the Acquis Communautaire. Over the last two decades, significant progress has been made to establish regular programs of household surveys to monitor poverty and other key policy variables in a systematic and consistent manner. However, substantial differences remain among countries in the region in terms of survey methodology and analytical approaches to measure poverty and social exclusion. Between 2007 and 2009, an expert group composed of representatives of Eurostat, the World Bank, DFID, and the national statistical institutes of Italy and Spain convened to elaborate recommendations on how the existing household survey systems of countries in the region could adapt to the requirements of collecting social inclusion indicators and eventually moving towards full compliance with the EU Survey on Income and Living Conditions (SILC). This chapter aims at taking stock of where countries are in terms of statistical developments and regular monitoring of the EU indicators of social inclusion and reviews the different options available to them to proceed further in the transitions towards full adoption of SILC.